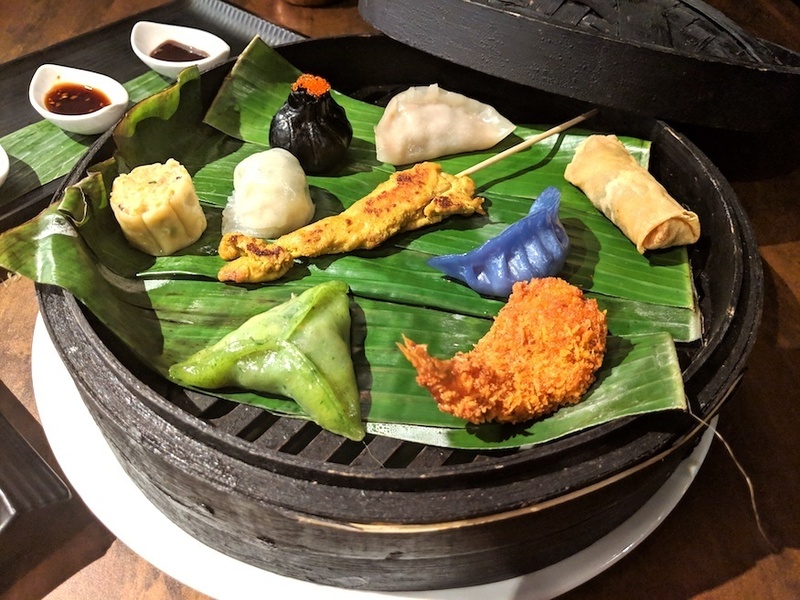 The plate of colourful dim sum poses some serious questions — do we start with the cornflower blue, prawn-filled one, or the black one with crab and fish eggs? As it turns out, they all taste amazing and don't last long whatever order they're eaten in — and they're more filling than expected. Even better, those fantastic colours are all from natural ingredients. Everything in Putney restaurant Yum-Sa is cooked in a kitchen visible from some of the tables, so diners can watch their dinner being cooked right in front of them. The cuisine is Thai fusion, with the restaurant adding its own twist on the classics. 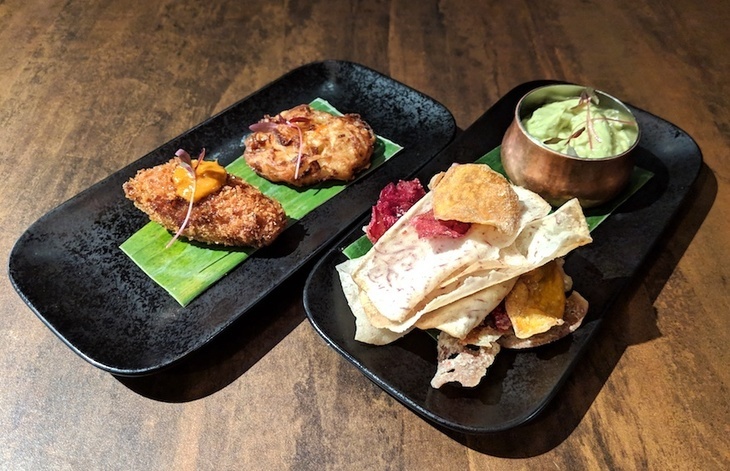 These include a refreshing watermelon mojito, and vegetable crisps to be dipped in a guacamole that conceals a delightful wasabi kick. The raw papaya is cooked to a crispiness that reminds us of the texture of an onion bhaji — we're fans. Pad Thai comes all wrapped up like a gift. 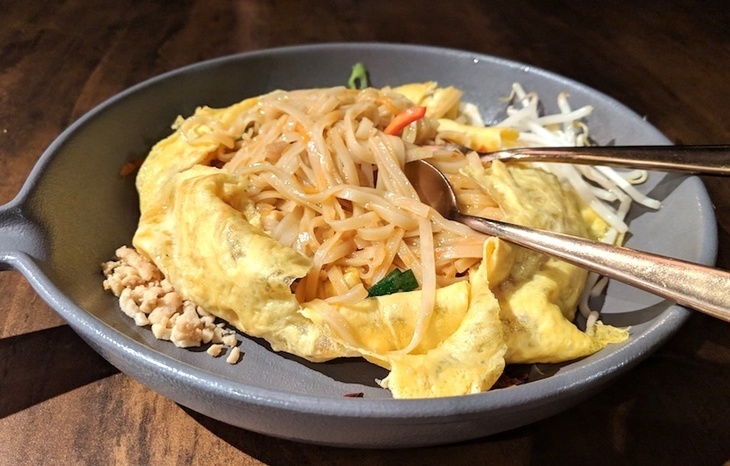 Even the Thai staple of Pad Thai arrives wrapped in an egg crepe. It's blander than we'd like, but mixed in with cuts of venison and roast duck, it's a hearty accompaniment. All this, and we haven't even covered the many tasty curries on the extensive menu. 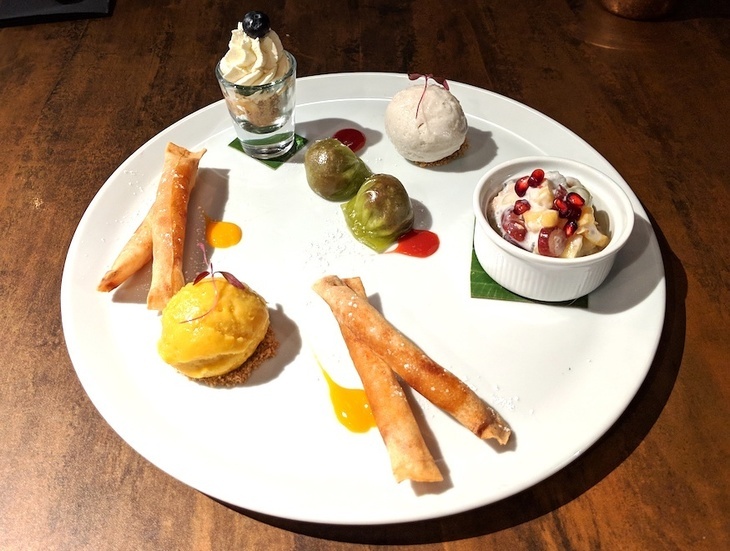 Dessert is a fantastic mix of sweet and savoury with warmed pineapple spring rolls and some surprisingly delicious coconut and mango vegan ice creams. A sweet and savoury selection of desserts. The decor deserves a mention too. Modern versions of colourful, traditional Thai masks are scattered throughout, livening the restaurant up. There's a commitment to showing contemporary art too, so the work of Chila Kumari Burman is on display when we visit. Her works blend together her diverse heritage with bright colours and tigers referencing her Indian roots, while her layered works also touch on UK politics and the role of women in society — it's more nuanced than your usual restaurant art. 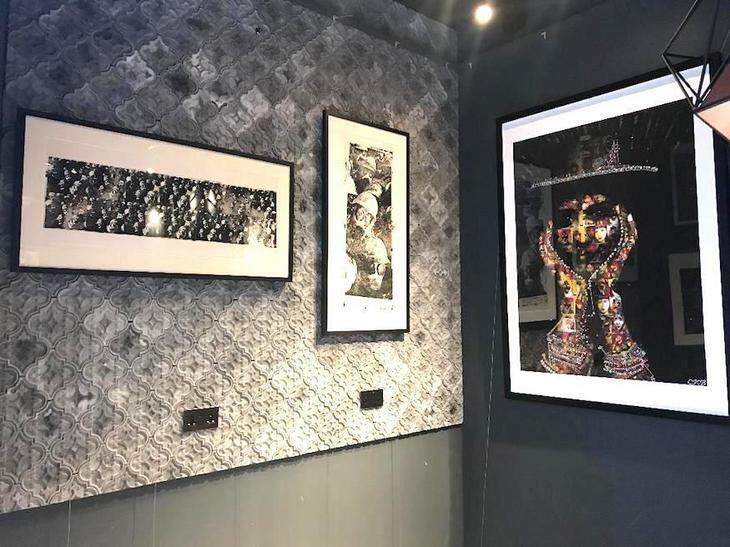 Some of the work of Chila Burman on display in the restaurant. Watching the way staff greet some of the other diners suggests that in its year of trading, Yum Sa has already gathered a pool of loyal regulars. It's just got itself another one. Yum Sa, 3 Plaza Gardens, 88 Upper Richmond Road, Putney, SW15 2DT. The work of Chila Burman is up until Spring 2019.